We adopted our dog Smith in 2013. He's the best dog we could imagine and it is he who motivated us to start our own business. He loves long walks - so do we! We didn't enjoy working in an office - neither did he! We love dogs - he's a dog! We wanted to be our own boss - so did he! He is highly motivated by food - as are we! We love living in JP - and so does he! To be honest, in hindsight it may have been a mistake taking business advice from a dog. He does very little actual work and he will never be allowed anywhere near a profit and loss report again, but no one knows more about dog walking than him. Smith has taught us about pace, route, how to tackle pulling, and most importantly that we should always take a second bag. We love Smith, we love pets, we love Boston and we're sure we will love working with you and your dog (or cat)! A native of the Boston suburbs, Hannah is a recent transplant to JP and has been with Boston Fetch since October 2016. After growing up in a house full of arguably too many cats, she is finally living her dream of becoming a fully-fledged 'dog person' (without giving up the kitties of course). When not hanging out with other people's pets she enjoys knitting, baking, and deep frying every available food item. Hannah completed 2,651 walks in 2017. Erik is originally from the Boston suburbs and has lived in JP for the past 8 years. He has always been a cat lover, but after working with Boston Fetch it's safe to say he loves pups as well. When he’s not taking care of some pups or kitties, he spends his time painting, going to shows around Boston, and cooking tasty vegan food. Erik has been working with Boston Fetch since 2017. Erik completed 427 walks in 2017. Dan is a Miami native who moved to Boston in 2013 to study music at the New England conservatory and fell in love with the city (especially JP!). He loves dogs and misses his little Lhasa Apso mix in Miami so much that the only way he can cope is to walk your dogs! Outside of Boston fetch you can find Dan walking around JP, going to thrift stores and hiking around New England (when not playing music)! Daniel has been working with Boston Fetch since 2017. Daniel completed 116 walks in 2017. Kris has been a dog person since birth, and has been with Boston Fetch since January 2018. 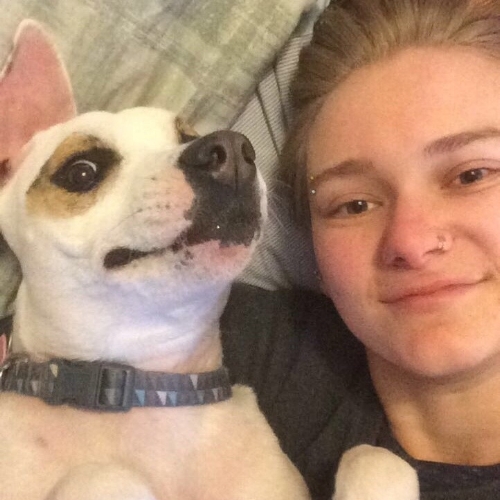 She spends her time doing yoga, painting, cooking, and training/cuddling her adorable American Staffordshire Terrier+Australian cattle dog mix, Carly! Her experience while volunteering at a humane society, her work with Carly, and her interactions with Boston Fetch pups have all been so awesome that she is considering becoming a professional dog trainer! Kris has been working with Boston Fetch since 2018. Hannah is a life-long animal person. She has loved many dogs and cats, beginning at age five with her family pet Kate, a smart and sweet calico cat. Hailing from central NY state, she has been lucky enough to reside it Jamaica Plain for over a decade. A personal care attendant, peer advocate, and massage therapist-in-training, Hannah enjoys remembering her dreams, cooking and baking vegan food, and wandering the Arboretum and Franklin parks. Hannah has been working with Boston Fetch since 2017. Zoe has been with Boston Fetch since August 2015. She's a JP native and was actually terrified of dogs as a child! She knew where every dog in the neighborhood lived and would avoid them all. Then one fateful day her mother sat her down and said "face licks are kisses, you know that right?" That changed everything. Zoe is a graduate of Victoria Stilwell's Dog Training Academy, and is a full-time behaviorist at the Animal Rescue League of Boston. Zoe has been working with Boston Fetch since 2015. Zoe completed 1,201 walks and training sessions in 2017. MJ has been working with Boston Fetch since April 2015 and has been working with dogs professionally since 2011. She loves spending her days outside with your pups, no matter the weather! When she's not having a blast with your dogs she can be found performing throughout the Boston area on the saxophone. MJ lives in JP and is also a music educator. MJ has been working with Boston Fetch since 2016. MJ completed 610 walks in 2017. MJ actually left Boston Fetch in 2017 but she was so amazing that we're leaving this up. Boom.